Newly obtained video shows what occurred in the minutes before gunfire and a fiery crash claimed three lives in the heart of the Las Vegas strip in February. The video shows several encounters between two vehicles, a Maserati and a black Range Rover, which authorities say was driven by suspect Ammar Harris, who was indicted Friday by a Clark County District Court grand jury on charges related to the Feb. 21 incident. Newly released video from a taxi shows a Maserati passing on the left, then stopping at a red light. Moments later, the SUV allegedly driven by Harris arrives from the right, spots the Maserati and stops in front of it. Then the driver says something through his open window. The light changes, the Range Rover takes off, and the Maserati pursues; they’re side by side when the taxi catches up at the next intersection. More words are exchanged, and both accelerate away. In the next block, the SUV swerves over, the Maserati brakes -- and it’s here that authorities believe Harris fired the first shot, mortally wounding the driver of the Maserati, Oakland rapper Kenny "Clutch" Cherry, and also wounding his passenger. 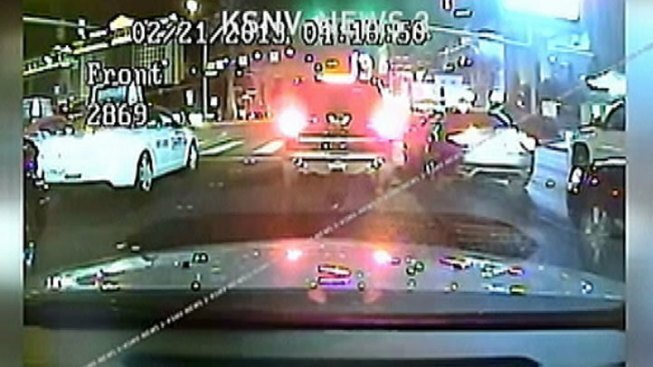 In the video, the Maserati continues past a red light, clipping a pickup, and then smashes broadside into a taxicab, which exploded in flames, killing its driver and passenger. The flash of the impact explosion was recorded by another taxi that was closer to the intersection. That video shows the approaching Maserati headlights. Three gunshots can be heard. The gunfire was one-way. There was no return fire; and victim Cherry did not have a gun, according to sources close to the investigation. Investigators believe that Harris was confused; the man with whom he argued back at the hotel had a gold Maserati, not black. Harris’ passengers told him he was focused on the wrong car, but he did not listen, according to sources cited by the Las Vegas NBC station, KSNV, which obtained the video . The Range Rover can be seen driving past the flaming wreckage, then disappearing out of sight of the taxi dash cams. Harris, a self-described pimp, was later found and arrested in Los Angeles. For six weeks he fought extradition, and now back in Nevada, was formally charged in Las Vegas Friday with three counts of murder. He potentially faces the death penalty. A separate indictment accuses Harris of a 2010 sexual assault against a then-18-year-old woman. The complaining victim re-contacted authorities after Harris was identified as the suspect in the February triple fatality on the Las Vegas Strip. Harris was also indicted in that alleged crime on Friday.